I'm a sucker for classic Alfas. They may not be the most reliable, but they have style and character and that's got to count for something. Don't get me wrong, the new 4C is amazing, but I think I would get more enjoyment out of this completely restored, low-miles, '71 GTV with a Buy It Now price of 30k. 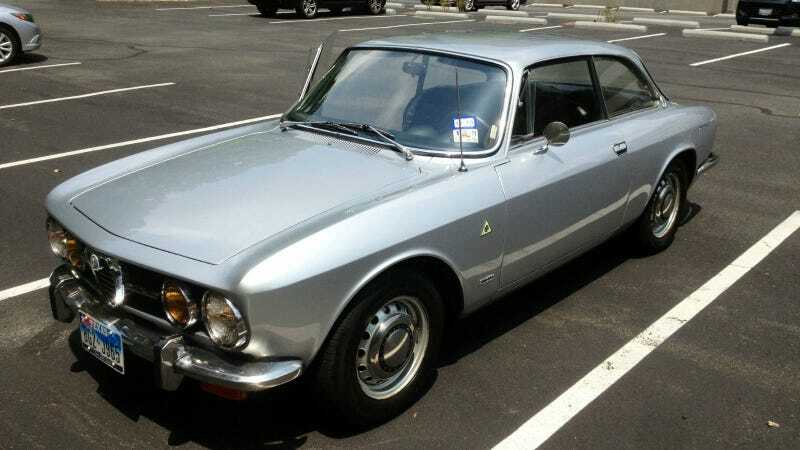 1971 Alfa Romeo Other 1750 GTV with AC! | eBay Motors, Cars & Trucks, Alfa Romeo | eBay! The paint exterior was redone twice in 2010 during the restoration. The first time, I tried to get the original silver (more of a navy ship grey) which I didn't like and had it re-done to this more vibrant silver which I prefer. I also had the side flash lights removed and the holes covered because I didn't like them. All the other exterior accessories were also removed, polished and or replaced. New emblems all around and new front grill, new front windshield with new liners. We did not do a frame off restoration as the engine compartment and undercarriage were in good condition. The interior is completely new. New leather seats front and back, new carpeting, headliner, wood trim, I installed a CD/MP3/USB connection and a new radio which is out of sight under the steering wheel to maintain the original look, as are the controls to the new powerful AC unit which I also added. I also have the original steering wheel if you don't like the sportier version which is installed. Room for improvement: the dashboard was the only thing I didn't restore – it seemed like a large and expensive proposition with no guarantee that it wouldn't crack again. So I have the plastic cover which looks fine – in fact I never glued it on so it's up to the new buyer to do what he wants with it. The paint job is still great, a minor spot near the rear windshield pretty common for this model (see photo) but nothing noticeable, I also didn't have the engine compartment painted as it was pretty good to start with and engine was already re-done so I didn't want to go through that again. The entire exhaust is new as are the brakes. The GTV or Gran Turismo Veloces were the most performance oriented of the Alfa 105 series coupes. While this particular model is the 1750 and not the upgraded 2000 version that came out in 1971, its fuel-injected motor made a respectable 120hp and 137 ft/lbs of torque. That power combined with a curb weight of 2,288 lbs made the GTV a formidable racecar. Buying an older Italian car is certainly a gamble, and while the price isn't cheap you would be hard pressed to find another well cared for example. Bidding ends tomorrow, so don't let this one get away.